Valladolid, 20 miles north, in the town of Jesus Maria. In the area surrounding the capital old haciendas and colonial buildings, spas and stunning Sierra Fria also settle beautiful. If you like sports, you can practice rock climbing, rappelling, fishing, mountain biking and camping in rural areas of the state. The beautiful scenery of Aguascalientes include El Sabinal, Cerro de Muerto, Canyon de Huijolotes, Potrerillo Tunnel, the Sierra del Laurel and the mountainous region of the Sierra Fria. On these sites you will find tour operators that will offer guided tours. In the village of Seats visit the monastery of the Lord of Tepozán and the Shrine of Guadalupe. Calvillo has a spectacular view of the fields of fruits, where you can take a break and enjoy delicious guava paste. The exhacienda The Quarter is known for its natural wonders. In Pavilion Arteaga visit exhacienda of San Luis de las Letras and delight with a glass of exquisite regional wine. Rincon de Romos runs the Museum of Insurgency and admires his interesting exhibition on Mexican history. San José de Gracia was founded in 1675 in a place called "Martha" in honor of its owner. However, its origin dates back to 1100 AD with the arrival of chichimecas, who settled there. The main attraction of the town is the Santuario del Cristo Roto. This steel sculpture 28 meters high covered with bronze is the work of sculptor Miguel Romo hidrocálido Santini, who inspired the poem "My Broken Christ" Father Ramón Cue Romano. Around 24 works are representations of Christ from around the state. As far as art is concerned, Aguascalientes has much to offer. Two of its most illustrious sons are the engraver José Guadalupe Posada, creator of the famous Catrina and inspiring Festival of Calaveras, and the painter Saturnino Herran, whose exquisite murals adorn the walls of the Palacio de Bellas Artes in Mexico City. The works of these artists of Aguascalientes may not have the best canvas so well preserved colonial buildings Fine Aguascalientes. At the Museum you can learn Guadalupe Posada Mexican symbol par excellence: the iconic Catrina (skeleton of a woman dressed in Victorian-fashioned). "Popular" artist, Posada worked for almost all publications in the country who opposed Porfirio Diaz, president of Mexico from 1876 to 1911. elaborated satirical political illustrations and lithographs, including his famous caricature of death, Catrina. The museum is a fascinating journey through the political past of Mexico, as well as a more detailed elegant contemplation of the grim reaper. If you have not been satisfied your taste for the macabre, the National Museum of Death holds more original works of Posada and other artists. La Feria de San Marcos and Cultural Festival of Skulls are directly related to Posada, who was born in the neighborhood where the festivities are held. The Museum of Aguascalientes is just one of many neoclassical buildings of the early twentieth century, the city; however, this building houses the works of some non-classical painters like Saturnino Herran, a native of Aguascalientes and protected from Diego Rivera, Pedro and Rafael Coronel (famous in Zacatecas). Vibrant Herran and naive paintings depicting local life and customs in the twentieth century and vibrant images, and sometimes abstract, the Coronel brothers, are reasons enough to attract us to spend a pleasant afternoon stroll through the elegant galleries museum. Herran painted commissioned portraits, but also a chronicle of details humblest of provincial life in Mexico: old men and young women revived under the vivid strokes of his paintings. Besides a nice cultural evening, the Museum of Aguascalientes offers a lesson in the history of Mexico. 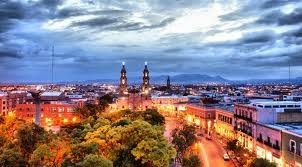 In any Aguascalientes you will meet an amazing fusion of colonial and modern. Some samples are worth visiting the Expo Plaza, which includes the monumental Plaza de Toros, an area for exhibitions and a shopping center. If you want to try your luck, the newly opened Convention Center San Marcos becomes a casino during the International Fair of San Marcos. Interactive Science Museum, Discover, and allow the Tech Museum explore the magic of outer space in his four permanent exhibition halls. Finally, if you like avant-garde culture, the Museum of Contemporary Art offers the latest news about the arts in Mexico. Something you can not miss during your stay in Aguascalientes is the Three Hundred Railway Complex. Besides fountains and green areas, has buildings that were erected in three different centuries. Between turbines and old locomotives you feel transported to the days of President Porfirio Díaz, when he began construction of the railroad in Mexico. Almost all trains in the country ever passed by Aguascalientes. Today the memory of the early Industrial Mexico remains in this exciting museum, ideal for an educational day with the family.